Strategies for Defending DWI Cases in Texas provides an authoritative, insider’s perspective on how to mount a defense against DWI charges in the state of Texas. This book guides you through the most successful techniques for defending against a DWI charge, including selecting the jury, questioning test result validity, and investigating the arresting officer’s administration of the field sobriety tests. Emphasizing the difference between DUI charges and DWI charges in Texas, the authors examine the unique challenges of DWI law in this state and offer advice on overcoming these obstacles. 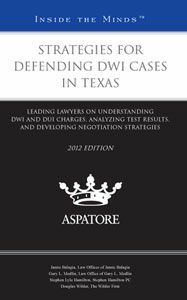 Request your copy of the chapter that Attorney Stephen Hamilton wrote to teach other lawyers how to try DWI cases.